Ideal for medium sized and awning style windows. Drop arm awnings consist of sprung arms and a roller. The arms can pivot, in an arc, through almost 180 degrees. As the arms rotate from vertically up to down and back the fabric is taken from the roll. Three types of operation are offered; cord, geared or electric motor. Cord control can be either external or internal, which can suit upper stories or areas that are not easily acceptable. Gear operation is suited to larger awnings. Motorisation suits hard to get to installations as well as large awnings. Adjustable side arm slides can be provided to optimise the position of the pivot arms. We can supply our drop arm awnings in a variety of materials and custom colours to suit your situation. Awning skins can be made from long lasting colour fast polyester/nylon blends, acrylic or canvas fabrics in either water resistant or water repellent grades. Drop arm awning operation can be manual via ropes, manual via crank operated gearbox or motorised. Motorisation is wired into one of the household 240v supply circuits. Operation is provided via a fixed control station or a hand held remote. 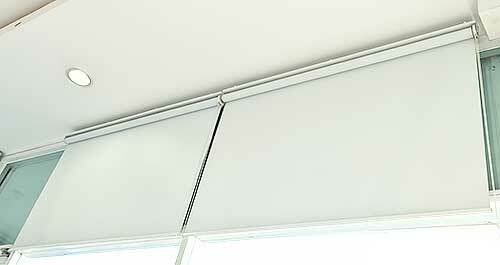 Multiple drop arm awnings can be controlled through a single controller. The benefits of fitting external Drop Arm Awnings include cutting down the heat, reducing household bills, reducing fading on furniture and carpets, allowing windows to stay open in rainy weather as well as increasing privacy.